One of Europe’s best players over the last decade, Hristo Stoitchkov, started his professional career in CSKA Sofia. He soon caught the eyes of many scouts because of his talent, but also for his temperament which caused him some problems over the years. Hristo was a player who was difficult to mark because of his pace and quick movements and most defenders were left behind when he had his sight on goal. Having scored 38 goals in his last season with CSKA, a total which won him the Golden Boot as topscorer in Europe, Stoitchkov then left Bulgaria for bigger challenges in Barcelona in the summer of 1990. He lived up to his reputation both as a lethal striker and trouble-maker in his first season at the Nou Camp. He was suspended for weeks having stamped on a referee’s foot on purpose, but he delivered the goods when he was on the field. He had many successful seasons in Barcelona which saw him win four straight league championships and a European Cup. He took part in his first big tournament for Bulgaria in the 1994 World Cup in USA. Bulgaria reached the semifinals against all odds and Stoitchkov was the key to their success. 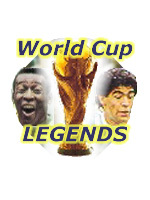 He proved on soccer’s biggest scene that he was one of the world’s best players scoring 6 goals and shared the topscorer title with Russian Salenko. He scored a great goal against Mexico in the second round and a well executed free-kick against Germany in the quarterfinal when Bulgaria came from behind to knock-out the defending champions. Stoitchkov won at the end of the year the European Player of the Year award with a record winning margin. He later had a short spell with Parma before returning to Barcelona for another couple of years although not with as much success as in his first period. At the age of 32, he was included in the Bulgarian squad for the World Cup in France, but neither he or the team could produce the form of four years earlier. 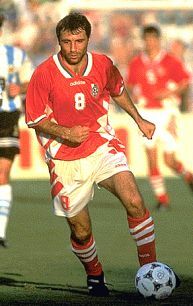 Stoitchkov retired in 1999.